Cameron not only survived his first trip away from home, he conquered it! He wasn't too sure about the Atlantic Ocean as it's not quite "bathwater" temperature yet. However, the wading pool at the hotel was definitely more his stride. This must have seemed like the biggest bathtub in the world, except for the fact that Jane did not wash his hair. 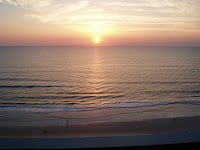 The sunrise from the Daytona Beach hotel room was incredible! Cameron also met his Uncle John, Aunt Judy and cousin John for the first time in Florida. Somehow, Cam knew they were family, because he had some big smiles and giggles for them. The plane ride home was so pleasant that some of the passengers actually thanked Chris & Jane for Cameron's quiet behavior as they exited the plane. It did seem that Cam was happy to be home, though, and slept a whole 12 hours his first night back in his own crib. Jane's 1st offical Mother's Day was very special. Chris & Cam gave her a beautiful orchid plant and a sweet card. Then the three of t hem went to surprise Jane's mom by attending church in Muskegon. Of course, everyone was so excited to finally meet Cameron, the precious boy they had heard so much about. After a delicious Mother's Day meal at Grandma & Grandpa Miller's, Chris, Jane & Cam drove home for a much-needed rest after such a busy, wonderful day.